When is GSTR-1A to be filed? What happens to changes made after filing GSTR-3? The information comes from the buyer’s GSTR-2 when he modifies any data. You as a seller may either accept or reject the changes. Changes accepted by you will be automatically reflected in the GSTR-1. GSTR-1 is a return which contains all the sales details. It is filled up and filed by the taxpayer. Information from your GSTR-1 will appear in your buyer’s GSTR-2 where he may change some information. The changed information will now appear to you in GSTR-1A. You have to accept or reject the edits. Let us look at an example to understand this. Ajay buys 100 pens worth Rs. 500 from Vijay Stationery. Vijay Stationery has erroneously shown it as Rs. 50 sales in his GSTR-1. The data from Vijay’s GSTR-1 will flow into GSTR-2A of Ajay. Ajay corrects it to Rs. 500. This correction is reflected in Vijay’s GSTR-1A. When Vijay accepts this correction, his GSTR-1 gets automatically updated. All changes in GSTR-1A must be accepted/rejected between the 15th and 17th of the next month. Changes made will be automatically reflected in GSTR-1. For example GSTR 1A for Oct has to be accepted/rejected between 15th to 17th Nov. If you need to change any data after 20th of next month (after filing GSTR-3), then the same you cannot be update using a GSTR-1A. All revisions must be done in heads 9, 10 and 11 of the next GSTR-1 return. There are 5 headings in GSTR-1A format prescribed by the government. We have explained each heading along with the details required to be reported under GSTR-1A. GSTIN – Each taxpayer will be allotted a state-wise PAN-based 15-digit Goods and Services Taxpayer Identification Number (GSTIN). Month, Year – Mention the relevant month and year for which GSTR-1A is being filed. Changes made to normal sales invoices (no reverse charge). Changes made to sales invoices attracting reverse charge. Exports will be covered in the next table. However, changes in actual exports outside India cannot be reflected as the buyer will not file any GST return. This heading will capture any changes made by buyers to debit notes or credit notes issued by you. 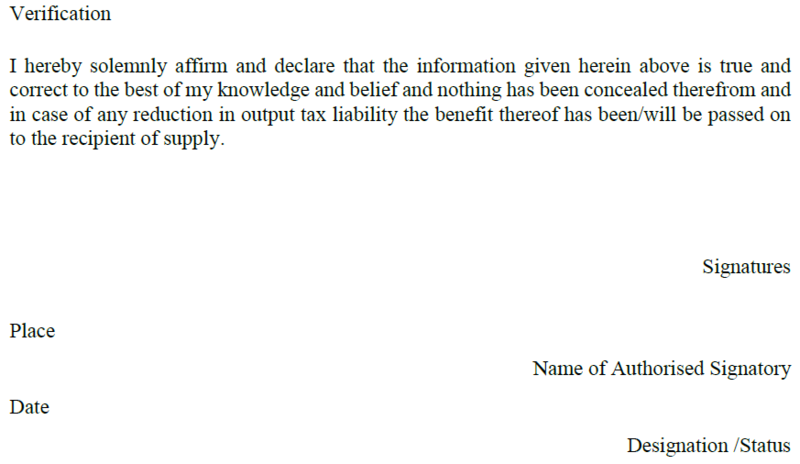 Finally, sign off with a declaration that all information has been supplied and is correct and any reduction in output tax has been passed on to the buyer. File your GSTR-1 & GSTR-2 Returns using the ClearTax GST Software.